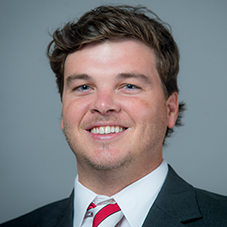 Will Bartlett joined the Razorbacks in the summer of 2011 following the hiring of head coach Mike Anderson and is in his eighth year with the program in 2018-19. He previously served as the video coordinator but embarks on his first year at Special Assistant to the Head Coach for 2018-19 campaign. No stranger to Anderson’s “Fastest 40 Minutes in Basketball,” Bartlett worked with Anderson for five years as a student manager and graduate assistant at Missouri before taking Arkansas’ Coordinator of Basketball Operations position prior to the 2011-12 season. Bartlett was promoted to the role of Video Coordinator in fall of 2013. In his current role, Bartlett will assist Coach Anderson and the men’s basketball program with external operations and projects, including community service, alumni and donor relations. He will assist in overseeing construction, graphics and maintenance projects while serving as a liaison between the men’s basketball staff and professional scouts/sports marketing personnel. Bartlett will also assist in tracking and promoting the overall academic progress of basketball student athletes and oversee video editing and analysis for men’s basketball program to develop performance efficiency reports for the coaching staff to analyze. As part of the Arkansas staff, Bartlett has helped bring Razorback basketball back to national relevance. The program has played in the postseason four times over the last five seasons, including three NCAA berths, while winning at least 20 games four times. After earning his undergraduate degree, Bartlett was retained by Anderson and his staff to work as a graduate assistant at Missouri. In that role, he coordinated film exchange, organized the video editing, assisted with scouting reports, oversaw the recruiting database and helped to organize summer camps. Prior to his increased role, Bartlett was the head student manager at Missouri and helped coordinate visiting team practices, supervised campers at summer camps, set up a training program for new managers, organized practice equipment and assisted coaches with drills and workouts. A 2009 graduate of Missouri with a degree in psychology, he also earned a master’s degree in parks and recreation from Missouri in the spring of 2011. He was a multi-semester member of the Dean’s List as an undergraduate and graduated in the top 15 percent of his class when he earned his master’s degree. A native of Macomb, Illinois, Bartlett is the son of David and Martha Bartlett. He was a four-year letterwinner in soccer, basketball and baseball at Macomb High School. He married the former Ashton McAllister on June 4, 2016 and the couple resides in Fayetteville.